Smoke detector can be defined as a device that senses smoke, typically as an indicator of fire and raises a security warning, generally a local audible or visual alarm from the detector itself. The global smoke detector market is expected to be driven by several factors like increasing number of government mandate policies to install smoke alarms in residential sector, increased fire-related expenditure of various enterprises, and rise in deaths & loss of properties, and technological advancements have created higher level application for smoke detectors. This report identifies the smoke detector market size for the years 2014-2016, and forecast of the same till the year 2022. 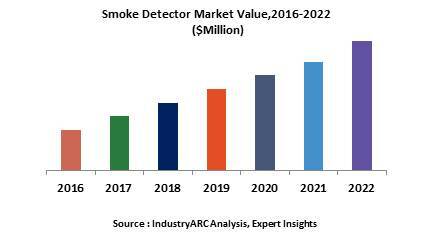 It also highlights the market drivers, restraints, growth indicators, challenges, and other key aspects with respect to the smoke detector market.